Note: This post isn’t nearly as Inc.com-y or LinkedIn-ish as the title might convey. Honestly, I just had no idea what to title it. I write a list of ideas everyday. Okay, pretty much everyday. The lists are of anything… vacations I want to take, tutorials I should create, tricks I can teach my dog, … you get it. I wrote a list the other day that I want to expand upon and share with you. First, this list isn’t that giant. It’s like 7 ideas. Second, this isn’t a list about getting a job now. It’s more about setting yourself up to find a job in six months. Or a year. Or in five or ten years. It’s also about building a personal and professional network around things you are interested in. 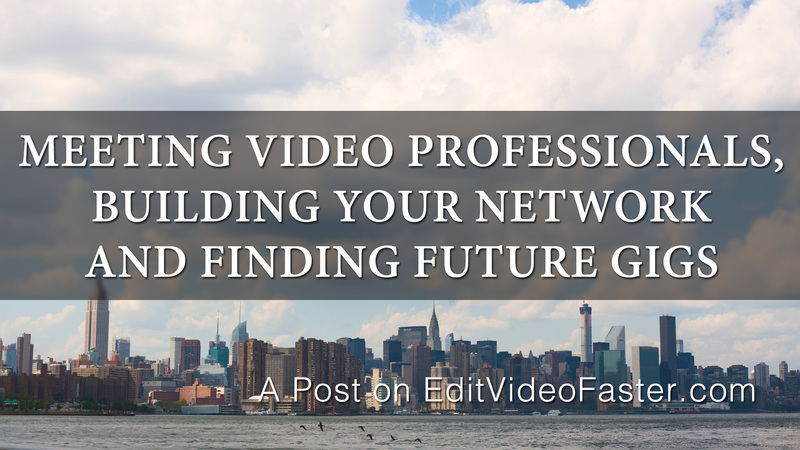 If you are new or trying to establish yourself in the video industry (or any industry) this post is for you. Even if you are already established in the industry I bet there are some ideas you’ll find that you can use to set yourself up better for future endeavors. Don’t just volunteer anywhere. I mean you can but think about it – why not volunteer your time at a place you want to potentially work at or with people you want to get to get to know? I volunteer pouring beer at events all the time and guess what? I LOVE IT. First, I’m the guy with the beer so everyone is nice to me. Second, I meet all kinds of people that I share a similar interest with. Whatever job you want, find someone nearby with it and take him or her out to lunch. A lot of people suggest coffee. This is okay but what’s in it for this person that barely knows you? A $4.55 latte? That’s not as convincing as a $25 lunch out at a cool, new restaurant. This isn’t as money-conscious as coffee but I feel that the return is much greater. The person at some unconscious level will feel indebted to at least give you some solid advice or keep you in mind for the future. During lunch pick his or her brain as much as you can without being annoying. Let me repeat: WITHOUT BEING ANNOYING. Find out how he or she got the position and ask for any ideas on what you should do to become as successful as he or she is. Side Note: Don’t just email someone out of the blue and ask him or her to go to lunch. Get to know him or her a bit, ask about his or her work and provide them value or some sort before asking them to spend an hour at lunch with you. I think it goes without saying that you are paying for the entire meal. Make sure to tip well too. *This requires you have some equipment of your own to shoot and edit on. There are pretty cheap cameras you can get started on. And you can download a 30-day trial of Avid Media Composer and/or Adobe Creative Cloud. Find a local small business that meets three criteria. They can use a video and/or animation for their website or social media. They’re cool and you have somewhat of a relationship with them as a customer. The small business is something that you’re into. Don’t spend 20 hours cutting a video about knitting if you hate knitting. If you enjoy running, find a new local running store. You like dogs? Create an adoption video for a nearby dog rescue non-profit. Why? You have something new to put on your reel. It’s something you created for a client. Doing projects like this teaches you so much about the industry and selling (you are selling your services, even if that’s for free). The company will hopefully speak highly of you to others and refer your services. Or the company will ask you back to do another. They might expect it for free again and if they do you can either do it for free or negotiate a price. Hey – if you like this post and want to receive email updates for new posts (I come out with a new post like this every Wednesday and a new tutorial video every Friday) punch your email address in the box in the top-right corner or at the bottom of the page. I cannot express the amount of doors that open up once you put your thoughts out there for the world through text, video or audio. Without a doubt it’s the single best career-building and networking tool in my life. That isn’t why I blog and have websites but it’s certainly not a bad side effect! Take a camera. Set it on a tripod. Hit record and let someone record his or her life story. Have him or her supply you with old pictures throughout the years that go along with his or her story. Add some title screens between events, some Ken Burns-style picture montages and sappy stock music. What’d you just do? You sold your services like you did in #3. You created a meaningful video for someone to share with his or her family and friends. This person could refer you to his or her family and friends too (that’s when you charge!). You dealt with a client from start to end on a project, which is a crucial skill to have. For what it’s worth, I have not done this yet. However, it’s on the top of my list of upcoming projects and above is what I expect to happen. With 10,000 views, you had to have done something right. 10,000 views are ridiculously difficult to get. It’s a vain goal that I want and am yet to achieve for myself. 10,000 views means 10,000 people have now seen your work. That means 10,000 people have had the chance to see your demo reel linked in the description bar. Getting 10,000 views is something to talk about at job interviews or networking events. Get a group together for a movie premiere. Go out to a bar/restaurant/coffee shop afterwards and lead a discussion about it. 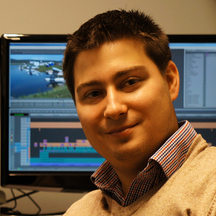 Hold a video editing basics or filming basics class at the library. I believe you can rent rooms for free at many public libraries. Have a happy hour venting session where editors can complain about producers and the stresses of the job. Suggestion: pay for the first round and a few appetizers. A strong network in areas that you are interested in is the key to having a happy and successful career. I went through some ideas and tactics that I’ve used or hope to soon use. Volunteering, treating editors to lunch, creating videos for small businesses, blogging/vlogging/podcasting, helping to create a video memoir, getting a YouTube video with 10,000 views and hosting an event are just a few ways to do this. I’m sure you have ideas of your own though. What do you think? Share your ideas in the comments! Thank you as always for reading. I tremendously enjoy every comment, share and view I get. Thank you. I can’t wait to read your ideas and I’ll see you on Friday with a new tutorial. Oh, and if you have a better title for this post I’d love to see that too!